Accusations leveled in a recent Granuflo lawsuit state that plaintiff William Cox died as an alleged result of his exposure to the dialysate. The short form complaint was filed directly into the Fresenius Granuflo/Naturalyte Dialysate Products Liability Litigation on April 22, 2015. Debra Phelps is the anticipated personal representative of the decedent, who resided in Sun City, Arizona. 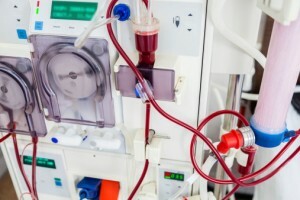 The claim states that Cox had routine hemodialysis treatment with the defendant’s product at the Banner Boswell Medical Center, and then passed away on April 23, 2013. The multidistrict litigation is proceeding in Massachusetts District Court, under the auspices of the honorable Judge Douglas P. Woodlock. Established in 2013 to better manage the growing litigation against Fresenius Medical Care (FMC), the MDL has amassed thousands of claims involving similar injuries attributed to elevated bicarbonate levels in the blood after exposure to Naturalyte and Granuflo. All of the lawsuits consolidated under MDL 2428 involve allegations that GranuFlo and NaturaLyte are defectively designed and manufactured. Plaintiffs contend that Fresenius was aware of, or at least should have known that their dialysate additives could cause cardiovascular injury, heart attack, stroke, cardiopulmonary arrest, and/or death, but did not provide adequate warnings of these risks. Judge Douglas Woodlock has been assigned to oversee this complex mass tort litigation, with the possibility of facilitating settlement talks. Bellwether trials for the Naturalyte and Granuflo litigation have been scheduled for January 11 and February 16, 2016. If the first two trials don’t spark a global settlement, each case will be transferred back to its original court for trial and final resolution. March 29 is the date the FDA reported on a Class I recall of GranuFlo Acid Concentrate and NaturaLyte Liquid, sparking litigation as thousands of dialysis patients made the connection between their injuries and FMC’s products. Those like Debra Phelps who have taken legal action against FMC are demanding legal reparations for loss of income, loss of opportunity, loss of family and social relationships, and medical, hospital and funeral expenses in addition to pain and emotional suffering.